As China’s economy continues to sputter, many local companies are having difficulty servicing their debts. A look at 3,000 listed Chinese businesses by French investment bank Natixis found that interest costs exceeded cash flow for 18.5% of them last year, compared with 8% in 2010. Real estate, the most debt-ridden sector, saw its leverage level reach 197% last year, nearly double the figure for 2008, according to Natixis. The investment bank estimates that almost one-third of listed companies in the sector are “zombies” – businesses that are on the brink of default but still taking on more debt. “The share of zombies in the real estate sector literally doubles the average in [corporate] China,” said Iris Pang, senior economist for greater China at Natixis. Evergrande Real Estate, for example, saw its ratio of total liabilities to earnings before interest, taxes, depreciation and amortization – or EBITDA – leap to 15.4% at the end of 2015 from 8.5% a year earlier. The figure climbed to 28.6% from 14.9% at Greenland Holdings, 26.8% from 9.7% at Sunac China Holdings, and 58.5% from 20% at Shui On Land. A study released in May by brokerage CLSA of China’s property, mining, manufacturing, utilities, construction, and wholesale and retail sectors counted potential problem debts of 14 trillion yuan ($2.14 trillion) as of the end of 2015. The property sector represented over half the total, at 54.1%, with industries plagued by excess capacity, such as utilities, steel and coal, accounting for much of the rest. Notably, most of the recent corporate bond defaults have come from these loss-making sectors too, including state-owned power equipment manufacturer Baoding Tianwei and Dongbei Special Steel. Worries about large-scale layoffs, especially in the steel and coal industries, have held the government back from pushing strongly on necessary capacity cutbacks. Instead, state banks have continued to extend more loans, said Francis Cheung at CLSA. Cheung estimates that the actual proportion of questionable debts on the books of China’s banks stands at 15-20%, compared with the 5.76% total reported by the central bank at the end of the first quarter for nonperforming loans and so-called special mention loans. Needing new debt to pay off the old. 72% of new debt is one year or less. Hmm..
Defaults and pulled sales are starting to gum up China’s bond refinancing machine. Chinese companies issued 382.7 billion yuan ($58.5 billion) of notes onshore this month, down 11% from the same period in April and 57% March, data compiled by Bloomberg show. With just eight trading days to go, fundraising may fall short of the record 547.3 billion yuan of debt due. That would mark a shift after sales were 83% more than maturities in April and almost three times higher in March. The faltering $3 trillion corporate bond market will test Premier Li Keqiang’s determination to weed out zombie companies dragging on growth in the world’s second-biggest economy. At least 10 issuers have reneged on onshore debt obligations this year, while 153 Chinese firms have pulled 175 billion yuan of domestic sales this quarter. Somewhere back in the depths of time the world got the idea that easy money — that is, low interest rates and high levels of government spending — would produce sustainable growth with modest but positive inflation. And for a while it seemed to work. But that was an illusion. What actually happened was textbook, long-term, surreally-vast misallocation of capital in which individuals, companies and governments were fooled into thinking that adding new factories, stores and infrastructure at a rate several times that of population growth would somehow work out for the best. China, as with so many other things, was the epicenter of this delusion. In response to the 2008-2009 financial crisis it borrowed more money than any other country ever, and spent most of the proceeds on infrastructure and basic industry. 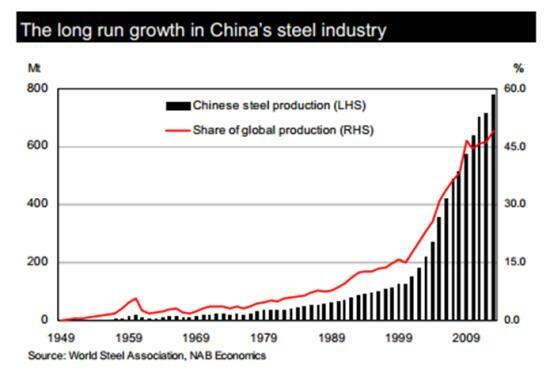 It’s steel-making capacity, already huge by 2008, kept growing right through the Great Recession, and now dwarfs that of any other country. The result was indeed higher prices for iron ore and finished steel up front (that is, the inflation the architects of the easy money era expected and desired). 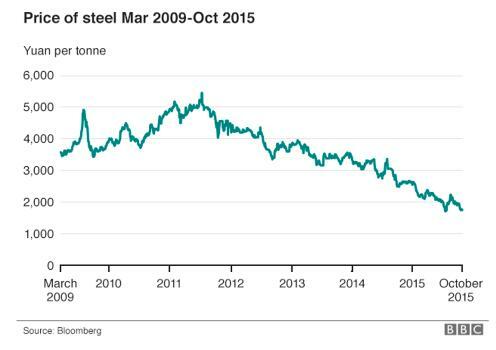 But this was soon followed by falling prices as the rest of the world’s steel makers tried to stay in the game. It’s the same story pretty much everywhere. Miners that produced the raw materials for the infrastructure/industrial build-out started projects based on inflated price projections and now have no choice but to keep producing to cover variable costs and avoid bankruptcy. Prices of virtually every commodity have as a result plunged. In the US, retailers built new stores at a pace that vastly exceeded population growth, apparently on the assumption that consumers would keep borrowing in order to buy ever-greater amounts of semi-useless stuff. 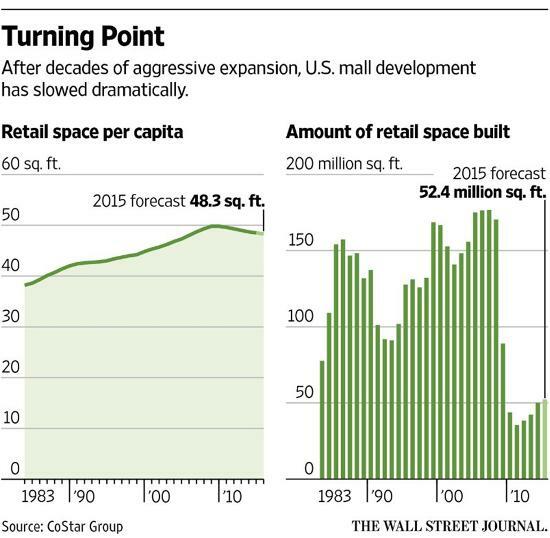 And now bricks and mortar retailing is suffering a mass-die-off. Something’s got to give at some point. There’s more cash sitting on company balance sheets than ever before. For the first time since 2012, that’s not enough. Combining all of the corporate cash in the U.S. wouldn’t cover the $1.8 trillion of corporate debt that’s coming due in the next five years, according to a report by Moody’s Investors Service on Friday. That’s because U.S. companies have been borrowing more quickly than they’ve built up the record $1.68 trillion of cash on their balance sheets. And more of that debt comes due sooner. “You’re seeing more and more borrowing,” Richard Lane, a senior vice president at Moody’s, said by phone. “The increase in leverage has been notable. Cash coverage of near-term maturities hasn’t fallen below 100% since 2012, and hasn’t been as low as its current 93% since the year before that, according to Moody’s. One reason may be that companies are making less money from merely running their businesses. Cash flow from operations declined 0.2% to $1.54 trillion in the 12 months ended in December 2015, the first time the metric declined in Moody’s data going back to 2007. To cope with sluggish global growth, companies went to the bond market to raise cash at rock-bottom rates. They issued a record $1.4 trillion of bonds last year, according to data compiled by Bloomberg. That helped lead to a 17% increase in the amount of company debt outstanding that matures in the next five years. In contrast, cash holdings only increased by 1.8% among U.S. non-financial companies at the end of 2015, according to Moody’s. The credit rater’s definition of cash includes short-term investments and liquid long-term investments. The United States issued a fresh warning to Japan against competitive currency devaluation on Saturday, exposing a rift on exchange-rate policy that overshadowed a Group of 7 finance leaders gathering hosted by the Asian nation. Japan and the United States are at logger-heads over currency policy with Washington saying Tokyo has no justification to intervene in the market to stem yen gains, given the currency’s moves remain “orderly”. In bilateral talks ahead of the second day of G7 talks in Sendai, Japan on Saturday, U.S. Treasury Secretary Jack Lew told Japanese Finance Minister Taro Aso that it was important to refrain from competitive currency devaluation. “Secretary Lew underscored that the commitments made by the G-20 in Shanghai to use all policy tools to promote growth – fiscal policy, monetary policy and structural reforms – and to refrain from competitive devaluation and communicate closely have helped to contribute to confidence in the global economy in recent months,” according to a statement by the Treasury Department. Prices for oil futures have jumped by almost a quarter since April, lifted by severe supply disruptions caused by triggers such as Canadian wildfires, acts of sabotage in Nigeria, and civil war in Libya. Yet flying into Singapore, the oil trading hub for the world’s biggest consumer region, Asia, reveals another picture: that a global glut that pulled down prices by over 70% between 2014 and early 2016 is nowhere near over, and that financial traders betting on higher crude oil futures may be in for a surprise from the physical market. “I’ve been coming to Singapore once a year for the last 15 years, and flying in I have never seen the waters so full of idle tankers,” said a senior European oil trader a day after arriving in the city-state. As Asia’s main physical oil trading hub, the number of parked tankers sitting off Singapore’s coast or in nearby Malaysian waters is seen by many as a gauge of the industry’s health. Judging by this, oil markets are still sickly: a fleet of 40 supertankers is currently anchored in the region’s coastal waters for use as floating storage facilities. The tankers are filled with 47.7 million barrels of oil, mostly crude, up 10% from the previous week, according to newly collected freight data in Thomson Reuters Eikon. That’s enough oil to satisfy five working days of Chinese demand, suggesting recent supply disruptions – which have mostly occurred in the Americas, Africa and Europe – have done little to tighten supply in Asia as Middle East producers keep output near record volumes in a bid to win market share. [..] the need to store oil is so strong that traders are calling up banks to finance storage charters despite there being no profit in keeping fuel in tankers at current rates. “We are receiving unusually high amounts of queries to finance storage charters,” said a senior oil trade financier with a major bank in Asia. “These queries come from traders fully aware that they will not make a profit from storing the oil. This isn’t a trade play, it’s the oil market looking for places to store unsold fuel,” he added. This story is getting very strange. The level of secrecy is off the charts. When Washington took over the beleaguered mortgage giants Fannie Mae and Freddie Mac during the collapse of the housing market and the financial crisis of 2008, it was with the implicit promise that they would be returned to shareholders after being nursed back to health. But now, with the unsealing of documents this week that were produced as part of a lawsuit filed against the government, new evidence is coming to light on how intimately the White House was involved in the Treasury’s decision in August 2012 to divert all the companies’ profits to the Treasury Department. That move effectively maintained Fannie and Freddie’s status as wards of the state. An email from Jim Parrott, then a top White House official on housing finance, was sent the day the so-called profit sweep was announced. It said that the change was structured to ensure that the companies couldn’t “repay their debt and escape as it were.” The documents also show Treasury moving to modify the terms of the mortgage finance giants’ $187.5 billion bailout shortly after a July 2012 meeting when the Federal Housing Finance Agency, Fannie’s and Freddie’s regulator, learned that they were about to enter “the golden years” of profitability. Since then, Fannie and Freddie have returned to the Treasury over $50 billion more than they received in the bailout. The amount they owe to the government remains outstanding. The new materials cast further doubt on arguments made in court by government lawyers that the profit sweep came about because Fannie and Freddie were in a death spiral and taxpayers needed protection from future losses. Documents unsealed last month also served to undermine that legal stance. The trickle of documents comes years after Fannie and Freddie shareholders filed suits against the government, contending that its decision regarding the companies’ profits was illegal. Defending against an array of these suits, lawyers for the Justice Department have requested confidential treatment for thousands of pages of materials. In a case brought in Federal Claims Court, the government’s lawyers asserted presidential privilege in 45 documents. David Cameron narrowly avoided the parliamentary defeat of his Queen’s speech this week – an event that, theoretically, triggers the fall of a government and hasn’t happened since 1924. That was only achieved through an embarrassing U-turn on TTIP, the Transatlantic Trade and Investment Partnership, which he ardently supports. One of the primary concerns about TTIP is that it could pave the way to further privatisation of the NHS. Yesterday, a group of MPs gave notice that they would table an amendment to the Queen’s speech, lamenting the fact that the government had not included a bill to protect the NHS from TTIP in its programme. The cross-party group was led by Peter Lilley, a long-time supporter of free trade and a former minister under Margaret Thatcher and John Major, and was supported by at least 25 Tory MPs – easily enough to overturn the government’s majority. Though many were Brexiters, by no means all were, and some, such as Sarah Wollaston, appear to have changed their position on TTIP. Realising he faced one of the most embarrassing defeats of his premiership – one not suffered since a similar motion removed Stanley Baldwin from office in 1924 – Cameron quickly said he’d support the amendment. Make no bones about it, this is a humiliation. The prime minister has repeatedly told MPs that TTIP poses no threat to the NHS. Yet to avoid the abyss, his government has supported an amendment contrary to these assertions. We must be under no illusions that he has any intention of moving to protect the NHS in TTIP. How did it come to this? The obvious answer is the EU referendum, which has brought into the open fundamental divisions within the Tory party. But this only provided the opportunity for parliamentary defeat. If this had gone to a vote, the vast majority of MPs opposing the government in fact support remaining in the EU, and wouldn’t take part in anything that would make Brexit more likely. The reasons go deeper – and they mirror what is happening all over the EU and US. TTIP started out as an obscure trade agreement that would create the world’s biggest “free trade zone” between the US and EU, and received little media coverage or parliamentary debate. Two years ago very few politicians or journalists had even heard of it. Yet a movement has built against this deal, one that has stunned the negotiators and forced the EU trade commissioner to call TTIP “the most toxic acronym in Europe”. Bestselling weedkillers by Monsanto, Dow and Syngenta could be removed from shops across Europe by July, after an EU committee failed for a second time to agree on a new license for its core ingredient, glyphosate. The issue has divided EU nations, academics and the WHO itself. One WHO agency found it to be “probably carcinogenic to humans” while another ruled that glyphosate was unlikely to pose any health risk to humans, in an assessment shaded by conflict of interests allegations earlier this week. EU officials say that while there could be a voluntary grace period of six-12 months, unless a compromise can be found, the product’s license will be allowed to expire on 30 June. One told the Guardian that after its proposal to cutting the authorisation to nine years was rejected, the bloc was now in “uncharted territory” with no clear path to a deal that could reach consensus. “Our position is clear,” he said. “If we can reach a qualified majority on a text we will go ahead. Otherwise, we have to leave the authorisation to expire and on 30 June member states will need to start withdrawing products containing glyphosate from the market.” Glyphosate is Europe’s most widely used weedkiller, and its parent RoundUp herbicide accounts for a third of Monsanto’s total earnings. The compound is routinely – but not exclusively – used on crops that have been genetically engineered to resist it. Several studies have linked blanket spraying with damage to surrounding flora, fauna and the entire food chain. But the commission moved to relicense it last November, after a crucial European food safety authority (Efsa) report declared it unlikely to cause cancer, although that paper sparked controversy. Philip Miller, Monsanto’s vice president of global regulatory affairs, condemned the EU’s failure to reapprove glyphosate as “scientifically unwarranted” and “an unprecedented deviation from the EU’s legislative framework”. Writing in a blog post, he said: “This delay undermines the credibility of the European regulatory process and threatens to put European farmers and the European agriculture and chemical industries at a competitive disadvantage.” Richard Garnett, the head of Monsanto’s regulatory affairs unit said that the situation was “discriminatory, disproportionate and wholly unjustified”. The US agri-giant is currently the subject of a takeover bid by the German chemicals multinational, Bayer. Under bloc rules, the commission could now go to an appeals committee but this would have the same balance of countries as the standing committee that has now twice failed to take a decision. It could also go over the heads of the EU states and independently reauthorise glyphosate as a draft measure. EU president Jean-Claude Juncker has said that he opposes doing this and officials doubt it will happen, although the procedure has been used to approve GM crops for import. A short-term license might also be possible. Glyphosate is so ubiquitous that its residues are commonly found in breads, beers and human bodies. More than 99% of people in one recent German survey were found to have traces of the compound in their urine, 75% of them at levels five times the safe limit for water or above. But the very definition of a safe limit for chemicals such as glyphosate is contested, and linked to a broader regulatory divide between the US’s risk-based approach which errs towards product approvals where doubt cannot be quantified, and the EU’s hazard-based approach, which leans towards a precautionary principle in such situations. EU governments showed Turkey a united front in the battle over visa-free travel, insisting Ankara narrow its terrorism legislation to qualify for the perk. The stance by European home-affairs ministers underscores a threat to an EU-Turkey agreement that has stemmed Europe’s biggest refugee wave since World War II and eased domestic political pressure on leaders including German Chancellor Angela Merkel. Turkey sought EU visa-free status in return for signing up to the mid-March deal, under which irregular migrants who enter the EU in Greece are sent back to Turkey and Syrian refugees in Turkish camps are resettled in Europe. The EU has said Turks can win visa-free status by mid-year as long as the Turkish government fulfills five remaining criteria – including on the terrorism law – out of a total of 72. Turkish President Recep Tayyip Erdogan has signaled he won’t bow to the European demand over terrorism legislation, citing terror risks in Turkey that his critics say are being used as cover to jail political opponents. “We have a clear statement and a clear agreement on visa liberalization: it goes through if you meet the criteria,” Klaas Dijkhoff, migration minister of the Netherlands, current holder of the 28-nation EU’s rotating presidency, told reporters on Friday in Brussels after chairing a meeting with his counterparts from the bloc. “We will see if, over the next few weeks, the criteria are met. If so, we will go ahead. If not, well, then not. It’s as simple as that.” The standoff pits EU political principles against Turkish geopolitical power. Migrant flows into Europe via Turkey during the past year have handed Erdogan leverage over the EU, which has lambasted him for cracking down on domestic dissenters and kept Turkey’s longstanding bid for membership of the bloc largely on hold. Europe speaks with forked tongue. Germany, which championed the EU-Turkey deal, in particular pressed Greece for an acceleration in returning migrants to Turkey. German Interior Minister Thomas De Maiziere said that while Turkey is sticking to its part of the deal and arrivals in Greece have dropped, “on the Greek side, procedures take too long and the returns to Turkey are not happening with enough determination.” Mr. De Maiziere said he spoke to his Greek counterpart about the first appeal case won by a Syrian on Friday against a ruling to send him back to Turkey. He said “it was up to Greek authorities to establish what happened,” while insisting that Turkey is a safe country for Syrian refugees. “Turkey has sheltered 2.5 million refugees, this is a tremendous performance. Despite all political debates that we can have and which are justified. we can’t doubt Turkey’s safe country status,” Mr. De Maiziere said, in reference to a decision Friday by Turkey’s parliament to strip lawmakers critical of the government of their immunity. Given that the Greek appeals body isn’t controlled by the government, the Greek minister asked for support from the EU to state that Turkey is a safe country where Syrian refugees can be sent back, according to one participant in the debate. “Member states today made it clear that they support Greece in considering Turkey a safe country for the return of migrants,” EU migration commissioner Dimitris Avramopoulos said. Can’t very well ignore your own judges. But the pressure will be relentless. The EU-Turkey migration deal has been thrown further into chaos after an independent authority examining appeals claims in Greece ruled against sending a Syrian refugee back to Turkey, potentially creating a precedent for thousands of other similar cases. In a landmark case, the appeals committee upheld the appeal of an asylum seeker who had been one of the first Syrians listed for deportation under the terms of the EU-Turkey deal. In a document seen by the Guardian, a three-person appeals committee said Turkey would not give Syrian refugees the rights they were owed under international treaties and therefore overturned the applicant’s deportation order by a verdict of two to one. The case will now be re-assessed from scratch. The committee’s conclusion stated: “The committee has judged that the temporary protection which could be offered by Turkey to the applicant, as a Syrian citizen, does not offer him rights equivalent to those required by the Geneva convention.” The decision undermines the legal and practical basis for the EU-Turkey deal, which European leaders had hoped would deter refugees from sailing to Europe by ensuring the swift deportation of most people landing on the Greek islands. After signing the deal on 18 March, EU officials claimed these deportations would be legally justified on the basis that Turkey respects refugee rights. But the EU’s executive has little control over Greek asylum protocols. The committee rejected the logic of the EU-Turkey deal, citing some of the EU’s own previous directives as explanations for their decision. This topic contains 2 replies, has 3 voices, and was last updated by seychelles 2 years, 11 months ago. While not a fanboy of PCR’s; he definitely has his moments of clarity; Hudson is one of those moments, IMO. Debt is good, gold is not money, and neo-liberal economics is the savior of the world. Just the latest ZH thinly-disguised “buy gold” infomercial.